I have as many questions as anyone else about local citations, but I can explain in pretty simple terms my suggestions for how you can get yours to help your local rankings rather than hurt them. The post I did on Whitespark in August was all about the nitty-gritty details. This one is bigger-picture. 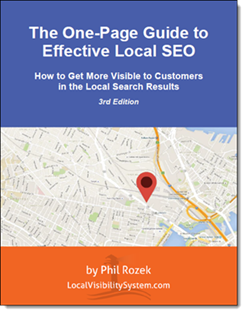 I’m talking about the rough sequence of steps for building local citations, which you need to do if you want to rank well in local search (Google+ Local and elsewhere). This post is for you if you citation-building seems like a jumble of tiny steps without any rhyme or reason, or if you have an employee who’s handling it but seems confused by the process. Basic principle: start with the sites where it takes a while to get a listing, do the ones where it’s quick to get a listing, wait, and work on the stragglers. Step 2. Do the listings that you can do in a few minutes each. I’m talking about pretty much all the sites you can name, except for the above. Step 3. Wait a month or two. Work on other stuff. Step 4. See if your listing has finally appeared on LocalEze. If so, claim it and make any corrections. (Read this first.) If not, check back in a month, after you’ve done the next couple of steps. Step 5. Check on the sites you submitted to in step #1; make sure those are complete. Step 6. Do any straggler citations – that is, listings you couldn’t or didn’t create or fix earlier, for whatever reason. Basic principle: stop the spread of incorrect info on your business by fixing your existing listings, then build new listings on sites where you’ve never been listed. Step 1. Claim and fix your listings on or submit your listings to the slow-to-digest sites (the ones I mentioned in steps 1 and 4 for a “new business,” above). Step 4. Wait a couple of months before checking on all your citations and making sure they’re all correct and complete. Questions? Workflow tips? Leave a comment!